The UK brand AVA electric actuators are one of the most compact industrial weatherproof electric actuators currently available, making them ideal for small bore ball valves and for OEMs and machine builders where space is limited. 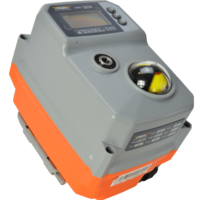 The distinctive orange and grey Smart AVA actuator has a remarkable feature set for such a compact sized industrial electric actuator, and since the introduction of the UK AVA brand in 2015, has seen dramatic growth on all continents, in a wide variety of applications across many different industries. The most impressive feature is the OLED screen and external push button user interface that allows the AVA actuator to not only be controlled locally but also allows changed to user friendly parameters to fine tune the AVA to the user’s needs. For some time the valve actuator industry has wanted a compact electric actuator that would give an electric valve a smaller overall package size as typically electric valve actuators are physically big. Many equipment manufacturers find that actuated valves will not comfortably fit inside their machines and find this frustrating, particularly for small bore valves, where the size difference between the electric actuator and the ball valve is dramatic, and simply want a small actuator. The AVA smart electric actuator solves this problem as it is very compact and offers a small overall valve and actuator package, particularly with small size ball valves where the assembly is a much more suitable small electric valve that will be far better not only for machine builders, but also as a zone valve actuator in HVAC applications. Actuated Valve Supplies promotes the AVA electronic valve actuator because it combines this compact size with a truly impressive feature list that fully justifies its ‘smart actuator’ title - not only has it versions that operate as a fail safe actuator or a modulating actuator, but it also has bus communications, wireless function and a timer option. An important feature is the AVA electric rotary actuator’s OLED screen and associated external push buttons which combine to provide local controls and the capability to make some important minor parameter adjustments that are normally only available with the industry’s leading electric actuator manufacturers, such as adjusting the open and closed positions, and speed control. 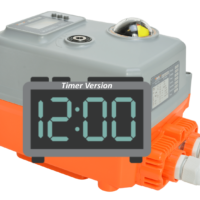 It is unusual that an electronic actuator can operate quickly, yet the AVA’s small actuator size, the Model 20, can operate in one second, opening a host of new applications that were not previously available to an electric actuated valve.